Update: Emily had her monthly visit with the hospital! It's nice she doesn't have to visit often. Yesterday she had her scheduled echocardiogram to see how her heart was looking after 4 years of treatment. We knew we would have to wait until meeting with Dr Gowda today to see how it went. After her appontment yesterday she was extremely exhausted so dad picked her up and she spent the rest of the day with her dad and taking a nap! This morning she had clinic and her monthly physical with Dr Gowda. We went over results of her echo and he was very happy with how it looked from 2 years ago so that is great! She has her port accessed and counts checked. She also gave her urine for HMA/VMA markers! Dr Gowda was happy with how she is doing and is happy with us continuing on what we are doing! She has complained of back pain, feet hurting and tummy pain here and there but nothing in her counts are showing issues! Results for HMA/VMA should be back in 7-10 days! Overall Emily is doing well and enjoying school and her friends. She is loving that she does not have to visit the hospital as often and we are too. However with the flu we are watching closely because with a fever she needs to go Inpatient! Hoping everyone is enjoying their New Year! What is a parent? A parent is a caretaker of the offspring in their own species. Are all those that have children set out to be parents/good parents? Not at all, because a parent is one who gives warmth, love, attention and protects their children no matter the circumstances. Doug and I have always tried to be the best parents that we can be to our three girls and we would do anything that we need to do to take care of them. We always place them above our own needs and take care of them before we take care of ourselves. While I think that Doug and I could be even better parents to our three beautiful girls, I know we have gone above and beyond, yet strive everyday to be better parents than yesterday. Over the last 4 years since we have traveled this journey with Emily, we have struggled with lack of support from the people that we had expected to be there the most. We have had a lot of help from many people and many of those are people we had never met, friends/friends of friends, and our community. We are also grateful to Jessie’s Father for being the great Dad he has always been, being there to pick up and take Jessie during the weeks when we have to travel or take Jessie to her appointments when we are not able to. We are thankful to close friends who have been there to help when things are needed, and family who have been there to help as well. But the help we are talking about is just moral and love support from parents. That has been a huge struggle because when you are going through something like cancer with your own child, you not only have to support your own child through something tough, but you also have to support yourself. Most of the time taking care of yourself normally comes last and while that is ok, sometimes you just need that shoulder, or love and support from your parents too. We struggled a lot when we would go to clinic and/or the hospital and seeing other cancer families having the love and support of their parents and sometimes even grandparents there for support. There is one family in particular that I can think of that lives in Texas and the little girls grandparents live over 5 hours away from them and the little girl has to travel often to Michigan. So many times this mom has (little girl’s grandparents) left her own husband at home and stayed with her daughter and granddaughter in Michigan to be there to support them with love and anything else that they need. There have been so many times that Doug or myself have sat in the hospital alone with Emily, and not had any support from anyone. We didn’t need help with our girls, sometimes we just needed that extra love and support. And honestly if we just had someone sit there and not say a word it would have meant the world to us, but that was never the case. A majority of the time it was never offered and Doug did so much traveling back and forth from the hospital to home to take care of all the basic needs at home and to make sure we were fed and had clean clothes at the hospital. There was never much help at home or the hospital but Doug and I always handled it and took care of what needed to be done. It was exhausting, but when it is your child you will go to any length to make sure they are happy and have what they need and Doug always did that. Doug has always gone above and beyond to take care of all of us and go that extra mile. For the past few years Doug has been working nights, as I work during the day. This is the best way for us to make our situation work. We are very fortunate that we have the companies we work for that support our Family through this journey and friends like Sue and Jo who take time out of their lives to drive over 6 hours from PA to VA, take time off of work to help us. While 4 years later, we may not have many hospital visits or inpatient stays with where Emily is at in treatment, but it sure would have been nice to have family who says they love you come around and want to be around and when they finally do stop by, they are looking for an easy out. But the last 4 years we have heard so many excuses as to why they couldn’t be around… studying for school, trying to find a job, working too many hours and when they said to call if we needed something, that one person you were looking for never showed, they always sent someone else. Grandparents play a special part in a child’s life. Children need to see that their grandparents are just as much part of their life as their own parents because they not only need this, but it also teaches them how to be a good parent when they get old enough to be a parent themselves. The siblings of children who spend a lot of time in and out of the hospital also need the attention of grandparents because a lot of the time the attention is on the child that is in treatment and they deserved to have some family attention. While I wish that this extra attention was given to my other children, it was not. They too spent a lot of time in and out of the hospital with Doug watching their Sister fight for her life. This long overdue update is something that I have struggled with, because it is about our experiences over the past 4 years. That struggle with having family living so close and minimal support has been really difficult, the struggle of people coming in and out of your lives is hard on your heart!! We receive many emails through this blog from many who ask about Emily or how they can help. Back in August 2014, I started receiving emails from someone, who from time to time would ask about how Emily is doing. I never thought anything of the emails, but then one day I was asked, “Do you know who I am?” I didn’t know who the person was because receiving emails from someone is not that odd. After receiving that email asking, “Do you know who I am?”. Well I learned within just one week this man was my biological Father (DNA confirmed 99.9%), and we have a Family that I didn’t know existed. Not only did I not know (Believing the man who raised me with my Mother was my Father), but the gentleman on the other end of the email did not know about me either and he was quite shocked himself. He was told by someone he had not seen in years, while he stopped at a gas station. He was informed about Emily's diagnosis, that they believe I am his first born & he has three other Granddaughters. We have started to build a relationship with my Dad, his Wife, my Two brothers, Two Sisters, and five nieces and two nephews and one beautiful Grandmother. We have many other family members we still have not met and hope to build a relationship with them also. For 36 years I was told someone else was my father and that man passed away 2.5 years ago, I asked my Mother to support my sister and I and come to the funeral for him to support us. She would not go with us and now today I know why she wasn’t there. Once I learned about this information, I confronted my Mother and stepfather and was lied to not only once but on several occasions. It was insinuated that they were tricked to come visit and felt like they had been "setup" and I should have never confronted them the way I did. They felt like it was a matter that could have been handled over the phone. Well we were headed on a 14 hour drive to Michigan for scans and I needed to know the truth. I could not wait the 6 days until we returned to Virginia and anxiety over scans. Since then there has been no phone calls made, or any attempt to try and make it right. No phone calls to say “sorry”, "how are you holding up?" and no phone calls to explain. No stopping by to see the girls, holidays have passed with no contact and two different scan dates have passed and no contact has been made. Two months after this happened, an email was sent to both my Mother and stepfather, but still no response either of them. The girls talk about their Nanny and Pop on an occasional basis, and 5 months later a phone call was made to them from the girls, and no answer and no return phone call have been made to them. A Christmas card was sent letting them know that the girls had tried to make contact with them with no response. The most difficult part of all this was having to sit down with my Husband & Daughters and try to explain what had happened. And then also learn that there are hereditary medical issues that I did not know about that could have affected Emily's prior/future treatments. Knowing my Father missed 36 Birthdays, I missed 36 Fathers days, my girls were cheated out of a little normalcy is very hard for me to swallow. I have held all of this in for so long and am finally letting this out because I can’t hold it in any longer, It has been very difficult for me to this keep all of this inside. So on the brighter side of this journey, the girls have a large family we didn’t know about and they have been very supportive thus far. All of them want to be part of Emily’s journey and share in the experience what we are going through. The girls’ grandfather want to be part of this journey and be in Michigan if we need him, and be wherever he is needed, if we were to make a phone call. I have asked myself a lot lately, Why would anyone want to walk into our situation or even inherit it? And for that love that this family has brought to us, means so much. 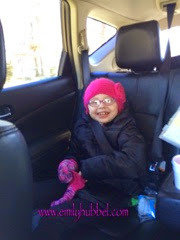 Remembering 2011, when we headed to Children's Hospital of Philadelphia for antibody therapy, prior Emily starting the next stage of treatment she needed to have scans. The radiologist found a new spot on her lower spine, so she was not able to continue on the protocol. We were told that there is no cure for Emily, and gave her 6 months - 1 year to live. They wanted to put her on a low dose chemo to buy her more time & hope for the best. We had the dreaded "quality of life talk". That is when we made the decision, we will do anything, go anywhere to save our daughter. We don't want any regrets. We promised each other as Emily's Parents and her advocate, there will be no, "we could have, we should have, we would have's." What ever it takes, what ever the cost, what ever the sacrifice, we have done it & will continue to. Some people think that we as parents overdo it, as a parent I don't think I can do enough. I do not want to miss anything. Every breath, every smile, every tear, every morning hug & kiss goodnight, and the constant "I love you's" daily. This blog is not about wanting people to feel sorry for us, feel bad for Emily or our situation. It was intended to keep our extended families & friends in Mass, VA, CT, SC, WV, PA, FL and so on informed on Emily's treatment process. We never thought that it would have taken off the way it did & Emily would have almost 8000 Facebook followers. We don't want Emily to be known as the little girl who has cancer. She wants to be just like every 7yr old. She is Doug’s first born and his biggest inspiration. Not for only what she has gone through, but was she has endured & become. She is very honest, companionate, and true to herself. She knows who she is, where she's at, and where she wants to be. Most adults can not say that! We are so proud of her and all of her accomplishments. We want Emily and her sisters to someday look back on this blog and understand the importance of family, and that we love them unconditionally, it does not matter how bad things are, we will be there for them no matter what!! Doug said something in the past that has really stuck with me. "There's nothing that could keep me from my Kids, I would desperately keep calling, texting, emailing, banging on their front and back door, whatever it takes to get through and make that wrong right." This latest update is not intended to hurt anyone. I hope by some chance some good will come out of this and people will take a long hard look at their relationships with their Family members, friends, or someone that has really meant something to you and try to work it out in this New Year. Life is too short & Family is everything.